Ancient Egyptians believed it was necessary to preserve people’s bodies after death so that their “ka” or life force” would be happy in the afterlife. Scientists believe Egyptians first used mummification around 3300 B.C. The highly involved process took several weeks or even months. A royal embalmer washed the body in the Nile River and then inserted a sharp tool through the nostrils to remove the brain. The embalmer made a slit in the abdomen and removed the lungs, liver, stomach and intestines, which were stored in four canopic jars, each guarded by its own God. The heart, the source of emotion and thought, was left intact. The body was was stuffed and covered with natron salt, which dried it out and removed all bodily fluids. Later the body was rubbed with perfumed oil and wrapped with linen before being placed in a sarcophagus and tomb. Put on the latex gloves and lay your hot dog on a paper towel. Measure the hot dog from end to end and record the results in your notebook. Place one end of the string in the middle of the hot dog. Wrap the string around the hot dog and note where the string ends meet. This is your hot dog’s circumference. Write the measurement in your notebook. Weigh the hot dog on a kitchen scale and write down the results. Put 1/2 inch of baking soda in the bottom of the plastic box. Lay the hot dog in the box and cover it with more baking soda. The hot dog must be completely covered. Put the lid on the box and store in a cool, dry place for 10 days. Don’t peek! After ten days, open the box. Put on a new pair of latex gloves and set the hot dog on a clean paper towel. Discard the baking soda in the trash and wash out the box in warm, soapy water. Dry it thoroughly with a clean towel. Measure the hot dog as you did previously, first for length, then circumference, then for weight. Record the measurements in your notebook. The hot dog should have shrunk. Place 1/2 inch of baking soda in the box and put the hot dog on top. Cover with baking soda as you did previously. Put the lid on the box and store it for another ten days. Open the box again and take measurements. The hot dog should be completely dry and shriveled (dessicated). Buy a tri-fold presentation board and make a display detailing the results of your experiment. 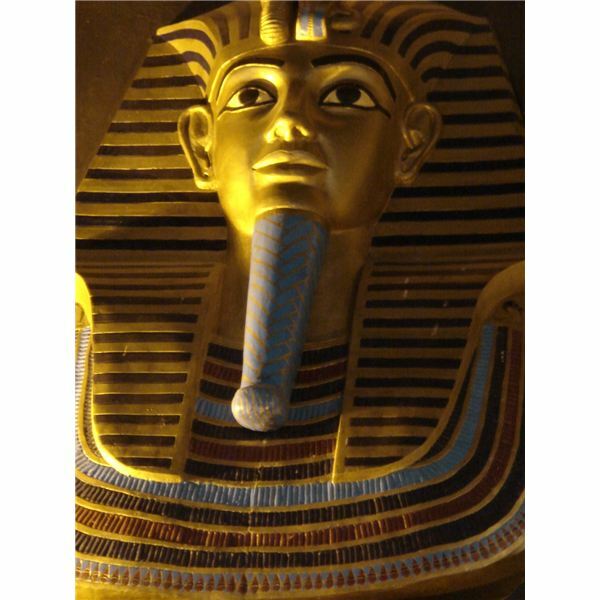 Write a report on the embalming process ancient Egyptians used to preserve their dead. Display photos of mummies to add visual interest. Bring the box with the baking soda and hot dog in it to display along with your presentation board. Learn more about Egyptian mummifcation by playing this game at Discovery Kids: Become a royal embalmer’s assistant. This article is based on information found at Science Buddies.